You want happily ever after? Go to Universal or something. We’re peddling unhappy endings here. The smorgasbord of original Fantasyland dark rides is one giant buffet of tragedy — a week’s worth of tragic French cinema crammed into a few acres of carnage. Here is life at its most stark and bleak. It’s unsettling just how many of these classic rides end on such a somber note, especially in what is considered the “kiddy land” of Disney theme parks. There are some very grown-up lessons to be learned here. As your mother told you time and again, life is not fair — all evidence of medieval tournament tents to the contrary. Snow White’s Adventures is a Fantasyland dark ride standard, appearing at most of the Magic Kingdoms around the world. Disney World’s version was evicted a few years ago to make way for the bland Princess Fairy Tale Hall. Even the version that it replaced was somewhat tame, with a dancing frog and a waving Dopey to set things right. That ride appeared in 1994. But make no mistake, the original 1971 dark ride was terrifying. There’s a reason they eventually called it Snow White’s Scary Adventures. A cackling hag pursues you through an endless black labyrinth, featuring more jump scares than the latest version of The Conjuring. And all that terror might be forgiven if the ride ever once acknowledged that true love always wins. But there is no love to be found. 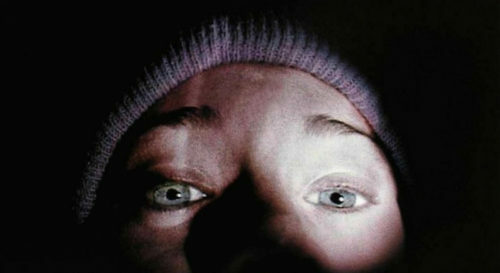 By contrast, the Blair Witch Project kids could at least be happy that they got an “A” in their film class. Famously, Snow White herself never appeared, leaving the audience in the role of the tortured heroine. There is no prince waiting to save us with love’s first kiss. Even the Seven Dwarfs abandon us in the end. At the conclusion of the ride, our mine car approaches a scorched cliff, with the Witch looming over us, tilting a diamond the size of a Volkswagon towards our car. If she succeeds, it would kill us in an instant — bashing in our skulls and splattering our internal organs all over the rain-slicked mountainside. The very last room of the ride was meant to represent our collision with this titanic boulder — a blinding explosion of thousand strobing starbursts. There’s no glass coffin waiting for us at the end because they’d still be picking up the bloody, mangled pieces. Most of Disneyland’s Alice in Wonderland dark ride is just as incomprehensible as the movie. The Queen of Hearts may scream “Off with your heads!” but just at that moment, we wake up and realize it was all a dream. Our caterpillar crashes through the doors into broad daylight and the ride is over. We are outside, yes, but somehow on the roof of the building. There’s a slow, meandering crawl down a ramp and we re-enter the ride for one last scene. It’s the Mad Tea Party, with singing teapots and crazy animals. Hey, it’s great in the movie, so I’m glad they decided to include it in the ride. 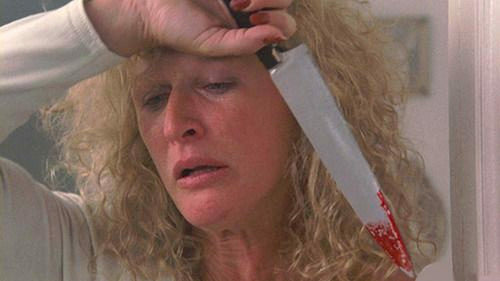 At this point, the Mad Hatter takes a page out of the 1987 Glenn Close thriller and kills the lovable bunny. Now the ride is over. What a coincidence! Today is her unbirthday too! You think I’m joking? 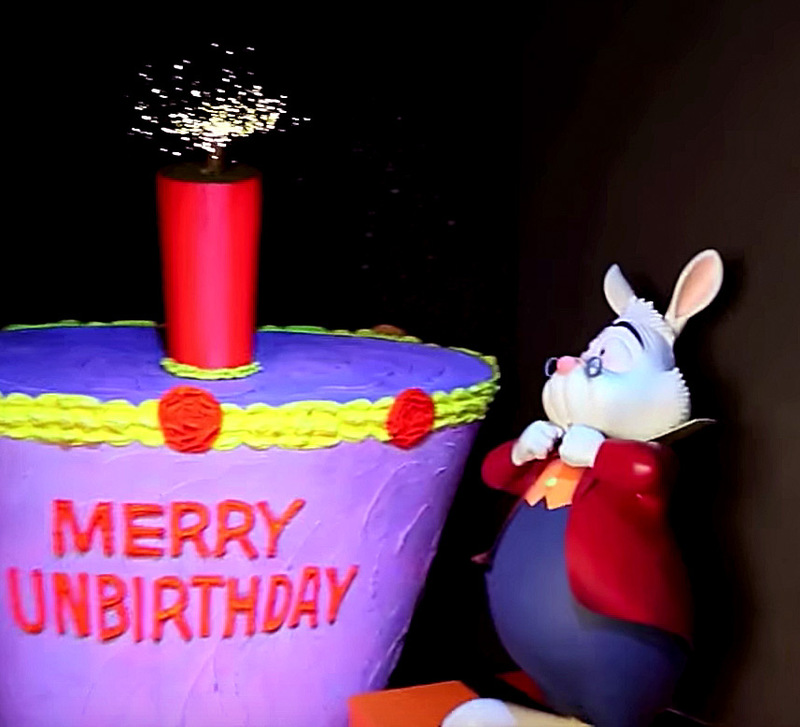 This is exactly what is implied by the last scene in the ride, which shows the White Rabbit quivering in fear next to a giant Unbirthday Cake. Jammed into the center of the cake is the biggest stick of dynamite you’ve ever seen. And the fuse is lit. And it has almost burned down. Disneyland literally refuses to let Glenn Close ride this ride. During the more recent refurbishment, projection effects were added to imply that the dynamite is actually a roman candle and it’s all just fireworks, ha ha. But the White Rabbit is dead. If you had the misfortune to cross the Mad Hatter, then there’s probably a rabbit stew boiling on your stove as we speak. Peter Pan’s Flight is a faithful retelling of the family film, with one big difference. In the movie, Pan and the children fly back to London, leaving Captain Hook with the crocodile. While the villain is clearly on the run, the movie leaves Neverland to focus on the joyous reuniting of the Darling family. 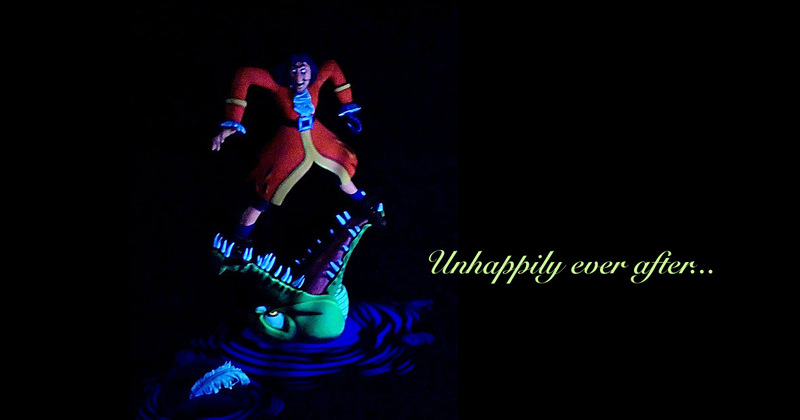 In the Fantasyland dark ride, we cut away from the happy children to learn Hook’s fate. 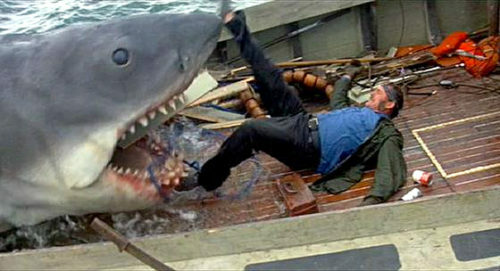 The last scene in the ride shows him literally in the jaws of the prehistoric monster, seconds away from being devoured while the only remaining responsible adult rows away in the wrong direction. Now you know what it’s like to grow up. Literally the exact same scene as Peter Pan’s Flight. You knew this was coming. It’s absolutely the bleakest ending possible — in any story ever. After leading a sinful life and dying a violent death, your soul awakens to discover that there is an afterlife after all. Worse still, there are two possible destinations. And you’re headed to the wrong one. What was Mr. Toad’s real sin? Where did he go wrong? In the movie, he stole a car, broke a few traffic laws, and caused his friends no small amount of heartburn. On the other hand, he also had a psychological condition and seemed genuinely remorseful. Does he really deserve a one-way ticket to hell, to be tormented by cackling devils? Disneyland certainly thinks so. Mr. Toad’s Wild Ride has you smashing through a city in your boosted vehicle, careening onto railroad tracks and plowing headlong into a locomotive. It’s the Snow White ending all over again — immediate, visceral death. Mr. Toad’s Wild Ride simply takes it one step further by tossing you into a fiery abyss, reserved for the likes of Hitler, Stalin, and probably that Trump animatronic. Have a magical day, kids. This entry was posted in Lost and Abandoned Disney Details and tagged Alice in Wonderland, Fantasyland, Mr. Toad's Wild Ride, Peter Pan's Flight, Snow White's Adventures. Bookmark the permalink. ← How to Survive the Parkeology WDW47 Challenge Parknado! I was so bummed when Mr Toad was taken out of the park. It was an awesome ride. We are right there with you. While I kind of like Winnie the Pooh as a ride judged on its own merits, there’s no question they should have added it without replacing Mr. Toad in the process. 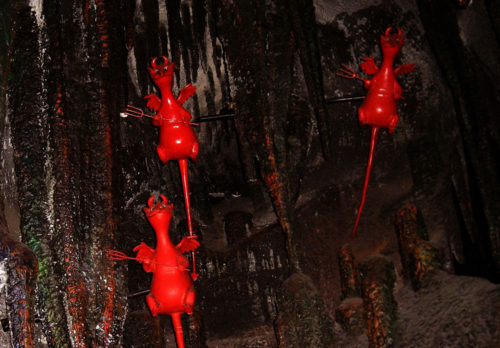 Oh my gosh, those demons DO look like Figment! Explains a lot about the current Imagination pavilion. Seeing John Candy turn into the devil in “Planes, Trains, and Automobiles” always made me think of the resident Satan of the Mr. Toad ride. Loved this article– and it made me wonder how Expedition Everest might have ended if the Imagineers who designed those Fantasyland rides had created it. Thanks. While I wonder if we will ever see the day again when Disney builds dark rides similar to the classic Fantasyland rides, I can’t help but feel they are greater than the sum of their parts. I’d much prefer to ride Mr. Toad than Rock n Rollercoaster. Mr Toad became my husband’s favorite ride because he was so surprised a children’s ride would actually end like that. Mr. Toad is still one of the highlights of any trip to Disneyland. It’s so gleefully subversive. Fairy tales are supposed to explore negative emotions like sorrow and fear. I vaguely remember a quote about Mickey Mouse proved cartoons could make audiences laugh and Snow White proving that cartoons could make them cry. Fairy tales do often reveal a dark side. it’s just hilarious to me that so many dark rides end on the down note. The experiences in this article are literally the last scenes in the rides. I’ve always enjoyed how, in that final scene of PPF, Captain Hook’s arms are long enough that he could scratch his ankles without bending over. Scratching your ankles is a dangerous proposition when you’re Captain Hook.